Warp Speed-Giving it all I Got, Captain! I have a little black and white 8/2 cotton left over from other projects so I thought I'd use it up by tackling this tartan that I've been wanting to weave for a long time now. 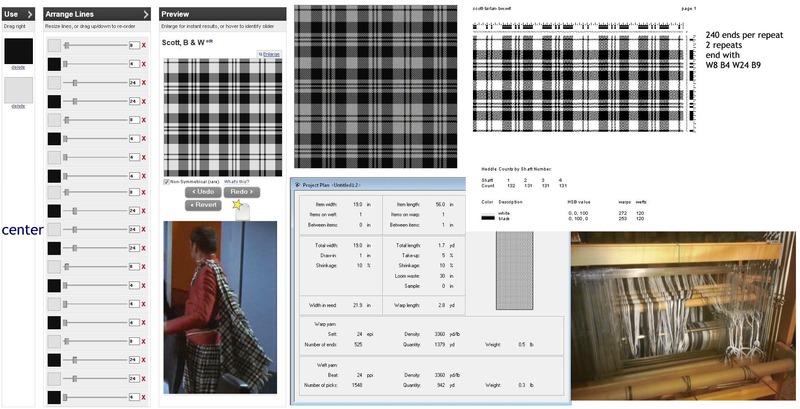 It's the Sir Walter Scott Personal Tartan, the same one that Montgomery Scott wears as part of his dress uniform on Start Trek the original series. I'm going to try and get 2 yards of 19" wide cloth out of this, or as much as I can anyway. I'm not entirely sure what I'll do with the yardage yet. Hat, vest front, bag, towel...I just haven't decided, but that's not important right now. This trek is not for the destination, but for the journey.